How to have a natural hospital birth. 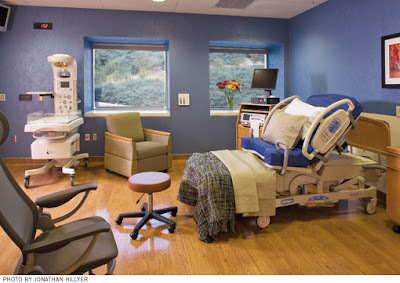 Is it possible to have a natural birth in the hospital. Of course it is! There is a lot of talk in the natural birth community about home birth and how fantastic it is. I am, of course, a fan of home birth. But realistically, most women will be birthing in the hospital for whatever reason. It IS possible to have a good, enjoyable, and natural birth in the hospital but there are some things that can make it more likely. Let's talk about some ways to ensure that you get a natural birth in the hospital. Rule 1- You choice of hospital is VERY important if you want a natural hospital birth. You need to be very aware of the hospital policies where you are birthing. If your hospital has rules that make it very difficult to have a natural birth, then you may want to shop around for another one. What are some hospital rules or policies that work against natural birth? What is your care providers c-section rate? What is the induction rate? What is the epidural rate? What is their policy on walking around? How do they feel about doulas? Do they have midwives on staff? Here is the thing. Please be honest with yourself about these factors. I have seen women "say" they want a natural birth and then choose to birth at a hospital that is literally the WORST in the entire state, simply because it was convenient for them to drive to. The chances of you not making it to the hospital in time to have your baby are very slim, especially for a first time mother. If you are not willing to drive a little way in order to birth in a hospital that is respectful of your wishes, then I really can't help you. Yes, it is possible to birth naturally in a hostile environment. It just won't be easy, and you will probably have to fight. Do you really want to fight while you are in labor? The next most important thing when planning a natural hospital birth is how your care provider feels about natural birth. Personally, I am a big fan of midwifery care. If your hospital has no midwives on staff, that says something very powerful about how they view birth. Namely, it says they view it as pathological. I have lived by many hospitals that have midwives on staff. In fact, there are a few in my area in which ALL women are assigned a midwife and only see an OB if they become high risk. Midwives are going to be trained more heavily in the normality of birth and will transfer care if you become high risk and there is a need. There is this thought that midwife=home birth or midwife=no medical training. Neither is true. Yes, there are midwives who are only home birth midwives. But a hospital based midwife is going to be a CNM, a certified nurse midwife. That means (usually) that she is an RN that has an advanced degree specializing in midwifery. These women often are very good at what they do. Yes, sometimes they are a little more medically minded than your typical home birth midwife. But, if you want to birth in the hospital that is your midwifery option. So, go with a midwife if you can. If an OB is your only option, then ask them the same questions as above. Take in your birth plan. Go over it with them. Find out what works and what doesn't. Be realistic and ask hard questions. Do not be brushed off. If you are, then CHANGE PROVIDERS. You are paying for this, don't pay for something that you don't want. I am a fan of Birth Boot Camp because they prepare the partner well. Whatever you choose, a longer birth class will do you more good. And be sure to take a class that is independent of the hospital. Many hospital classes tend to be more focused on teaching you how to be a good patient rather than how to have a natural birth. A well prepared partner will really make your life easier. Think about how tense YOU will be if your partner is scared to death because he doesn't know what is going on and is freaked that you are moaning in public. Prepare him too. Reading and preparing yourself and practicing relaxation outside of class is wonderfully helpful too. Doulas are not for everybody, but they can really help both mom and dad have a better hospital birth. Even when you have prepared well for a birth class, a doula can help you remember what you have learned. Even lots of dads just rave about their doula. If you want your partner to be your main source of comfort, you can always talk to the doula about helping HIM, help you. Labor can be long and an extra pair of hands can be really helpful. Don't arrive at your birth place too early. I am not going to tell you not to go to the hospital. If you want to go, then go. But many women cite the fact that they labored mostly at HOME as the reason why they were able to have a natural hospital birth. Where are you comfortable and where can you most labor how you want? Induction agents are so commonly used today, even for women already in labor. If you want to avoid them, then you may want to get some of your dilation out of the way at home, where you can move freely. Eat well during pregnancy so that you are low risk. Check out the Brewer Diet and consider following it. Your health pre-pregnancy health may be important too. Taking better care of yourself can help you have the birth you want. Natural hospital births are possible, but they require work and commitment. You can do it! I had a natural hospital birth! Like you pointed out, I labored at home as long as possible, walked into the hospital at 8 centimeters and pushed my baby out an hour later. I think that a lack of educating themselves is what keeps people from having a natural hospital birth. I also had a natural birth. My labor was 12 hours long. I walked into the hospitl ~5:30pm, and baby was born at 6:11pm. My water broke in the FAMILY WAITING ROOM of L&D. Why they sent me there when I was halfway pushing already, I don't know. But I was then rushed to delivery room, and pushed out my baby on my hands and knees within less than 10 mins. The only problem with this is that I didn't get any care while I labored. I had a doula, yes, but I do think it would have been good to get SOME heartrate and bp monitoring now and then. But, I am VERY, VERY happy with my birth! The tricky part is the postpartum. Right after my baby was born, staff began pushing on my tummy, stuck me in my arm and leg with pitocin, and kept trying to dry off my baby while i'm trying to nurse. I yelled at them to back off a couple times. Then of course in recovery, with all the feeding scheduling with the nurses--is, well, to put it lightly, annoying and frustrating. Can't wait for my homebirth, once I become pregnant again. Lindsay- that is true, and why I don't feel comfortable saying "don't go in till the end". Frankly, if you are going to stay home for that much of your labor, you may be safer with a HB midwife who can do intermittent monitoring so you know that the heartbeat is fine. Or, if money isn't a problem, hire shadow care with a HB midwife and go to the hospital before the birth, but then you get the advantage of heart tones at home and knowing when you are close to birth. This is a terrific post. I am forever grateful that I was able to deliver my son under the care of extremely skilled nurse midwives, at a local hospital with a truly beautiful and serene birth center. Our private room had a view of an ocean bay, and since my son was born at 11am, natural sunlight was streaming through the windows! No hep lock, and the nurses even brought me an english muffin during labor when the kitchen was closed. The nurse who attended us for our stay was also a lactation consultant. When my son didn't nurse the first day, I was taught to hand express some colostrum and we fed the baby by spoon; formula was never suggested. The nurses were completely reassuring and by the morning of Day 2, my son was nursing like a champ. Pain relief options were available but not pushed. I was encouraged to try different pushing positions and no one even mentioned the word "vacuum" even though I pushed for many hours. I felt comfortable knowing that if anything did go wrong, I was in a hospital with an OR and OBs on call. At the same time, the atmosphere was as non medical as possible - all equipment neatly tucked into wall closets when not in use. Room service brought us (yes, hubby too) very good food. As a final, family touch, the couch in the room raised up and attached to my hospital bed, so the three of us could snuggle together. If more women demand this type of experience, more hospitals will provide it. I was very happy with my hospital births. The first was not natural, I had a long labor and an epidural (they didn't push - I asked), and the second time around I chose the same hospital after visiting a couple nearer to me - even though at that point it was a 50 minute drive. The midwife team there is brilliant. I have only ever heard raving reviews from other people as well! It is, of course, still a hospital with policies, but they are very accommodating compared to a lot of other places I read about, and while the nurses can vary, the midwives (in my experience, which of course is all I can speak to) are 100% extremely supportive, helpful, and woman-centered (as they should be - but we all know not all are!). They didn't push for anything I didn't want; if I refused something they were respectful of that. If anyone in the Twin Cities MN area is looking for a recco, I'd love to talk with them about my experience at Methodist in SLP. My first birth was in a hospital setting with midwives and I loved it. I started having contractions (very far apart) around 12:30 am and I sent DH to work (he's a nervous nelly). I called him at 11:15 to come home (45 min drive for him to home) and we arrived at the hospital at 2:15pm (at 5 cm) and my DD1 was born at 2:57pm and we were home by 6:30pm. I would have chosen a home birth only my DH wasn't too keen on it. We had no medical intervention by any hospital staff as I was a low risk birth. My second was at home quite by accident. My water broke at 11:15pm (with no contractions) and I stood up quickly which stopped any escaping. My contractions started at around 11:25 but by 11:35 they were 5 mins apart for 45 seconds. We were getting ready to head to the hospital to meet the midwives but they were 2 mins apart and a minute in length and we likely wouldn't have made it (about 15 min drive). DH called 911 and 1 minute after they arrived DD2 arrived at 12:01am. In total 36 minutes of labor. Should we choose to have another one - it will be at home. I had a natural hospital birth, and didn't have to "fight" for much DURING it. But there was LOTS of conflict with my doctor before the birth (he wanted to induce for various reasons and I didn't see the need), and I needed to compromise on somethings that maybe weren't so important (was "allowed" to pass on the IV but had to have a hep-lock) and one thing I regret not insisting on (I wasn't "allowed" to delay cord clamping). My natural birth at home for the second baby was wonderful. Zero conflicts whatsoever. Hi -- great post! As the author of a book called "Natural Hospital Birth" you can tell I am on board. thebirthmuse.wordpress.com I would add that parents need to have a GREAT plan for what to do if a) mom's water breaks before contractions kick in and b) your care provider recommends induction for anything but a pressing emergency. I find that families with plans for these two common scenarios are better able to achieve a natural birth in the long run than families that have no plan in place when they face either of these scenarios. The "status quo" for both of these scenarios is a pretty medicalized experience, but it does not have to be that way! What Trish says is so true! A lot of women stick their head in the sand when it comes to labour and delivery but if you educate yourself, and do lots of research I think women would be much more likely to be able to have a natural hospital birth. 1. I chose a hospital that had a fantastic maternity department with midwives who were committed to the natural birth process. 2. I had an OB who was more than happy to let things happen the way nature intended and wasn't in a rush to 'manage' it all. 3. I did so much research and reading about labour and delivery during my pregnancy and stayed at home as long as I could and was only in the delivery suite for about 45 minutes before it was time to push (I was also very lucky too in that it seems my body was very ready to deliver the baby, progressing from 5 to 10 cms in about 15 minutes!) But I'm pretty sure if I hadn't prepared myself during pregnancy I wouldn't have coped with the labour and wouldn't have felt empowered enough to know I could do it without drugs. Next time I'd like to have a homebirth, especially after the fantastic experience my good friend recently had with a HBA2C, just have to convince the hubby! I LOVE all your ideas and tips to help woman have a natural childbirth. I have had 5 al natural. All were at home and all but one were in the water. Thanks for sharing! I had a 95% natural birth in the hospital. Compared to friends, mine was not the prettiest or most luxurious hospital. No view, uncomfortable beds, shower not hot enough. .. but I was respected and treated like a person. I got an epidural in the final 3 hours (out of 25) because I asked for it. I'd love to tell you my mostly natural -slightly medicated hospital birth story.